After I wrote that post, I placed a GTC (good til cancelled) trigger order with my broker to buy ASIA if the stock traded above $18.60. Sure enough, a week later, on Tuesday, ASIA broke out on huge volume. I was at an all day meeting on Tuesday, when ASIA broke 18.60 and I bought my shares automatically at around $18.66. One does not have to watch the market in order to buy break outs. Just use trigger or buy stop orders. ASIA closed Tuesday at 19.44. I will now place a GTC trigger order to sell ASIA if the stock falls below $17. These trigger orders take the emotion out of the trade. Note on the chart where “NA” indicates when ASIA appeared in the IBD New America column. It makes sense to monitor stocks that appear in the New America column. The QQQQ completed the 37th day of its up-trend on Friday. However, there were only 16 new highs and 5 new lows in my universe of 4,000 stocks on Friday. Five of the 16 were on my IBD100 lists: VNUS, GMCR, HANS, LINC and INT. All of these 5 but VNUS were also on the IBD New America page at some time this year. I keep a watchlist of New America stocks to look for possible winners. New America stocks are companies that IBD staff think have innovative products and exciting businesses. Both Nicolas Darvas and IBD’s William O’Neil have written that winning growth stocks tend to have great stories behind them. Most of the New America stocks eventually make it onto the IBD100 stocks lists. So it is worth watching these stocks. INT was on the New America list last February around $31 and closed on Friday at $41.90. And HANS was written about last January around $34 and closed Friday at $42.55. So, stocks on the New America list often take off sometime after their story is published in IBD. One recent addition to the New America list that looks promising technically to me if it can break $18.60, is ASIA. The media pundits claim the market needs to rest. The market gets tired and needs to consolidate for a while–such utter nonsense! I wrote a few posts ago that the rebound in the indexes thus far is actually quite small, compared with the rebounds in the 30’s. The Dow is up only about 24% from the bottom, compared with about 100% snap backs from the bottoms in the 30’s. The QQQQ is only in the 22nd day of its up-trend. 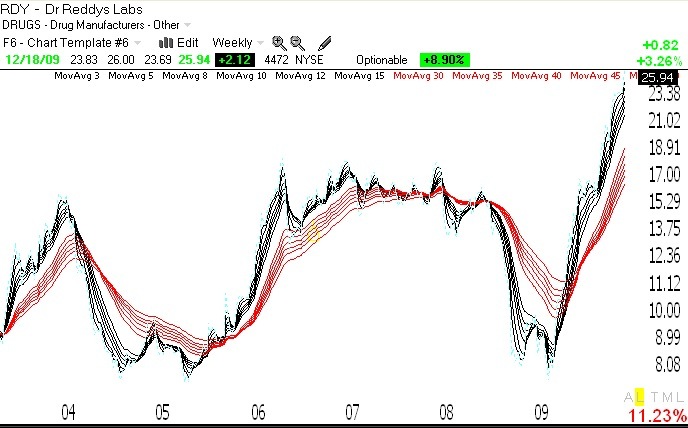 The up-trend that ended July 27, 2007, lasted 80 days! The current rally may have a lot longer to go. Meanwhile, by following the market’s up-trend and the GMI , my account is now in the black for the year and I am now working off the 5% loss from the prior year. How am I doing it? 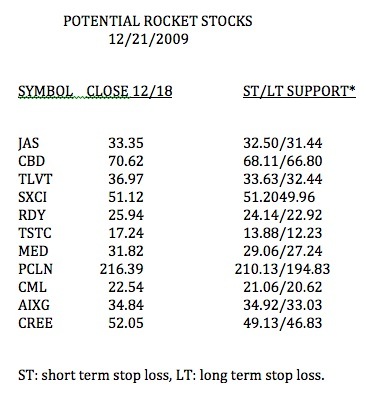 Just by buying the types of stocks that I list to the right of my post each day. Long positions in stocks like AAPL, GMCR and NFLX have helped, along with some call options on QLD. Now that so many stocks are in up-trends I am also writing cash secured puts in my IRA on stocks I hope never to own. I will write more about this interesting technique in a later post. There were 14 new highs and 409 new lows in my universe of 4,000 stocks on Tuesday. The T2108 indicator bounced back to 11%. Time will tell whether this bounce will lead to a real turn. I sold out my QID and began to make pilot buys in some of the IBD New America stocks. Each day the IBD New America section presents a company that they think represents a promising visionary business. I have created a watchlist of all New America stocks the past few months that I will monitor for break-outs. The following nine New America stocks closed Tuesday within 5% of their 52 week high and may be worth watching: NUVA,BABY,ACL,BMI,GHM,FLIR,TRLG,CELG,FCN. I own some of these.